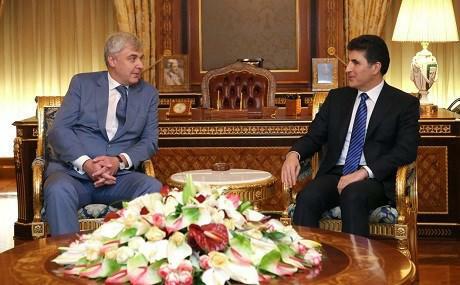 KRG Prime Minister Nechirvan Barzani met with Maksim Maksimov, the Russian ambassador to Iraq, for talks on Sunday. The meeting comes as Russian oil and gas giant Rosneft expands its operations in Duhok province. During their meeting, Maksimov praised recent progress made in resolving tensions between Erbil and Baghdad in the wake of the October 16, 2017 events, which saw the Peshmerga withdraw from the oil-rich province of Kirkuk and the disputed territories in the face of an Iraqi offensive. According to a statement from Barzani’s office, the KRG PM briefed the Russian ambassador on the Erbil-Baghdad dialogue and on recent developments in the Kurdistan Region. Barzani said the Kurdistan Regional Government has thrown its support behind the new Iraqi Prime Minister Adil Abdul-Mahdi. Talks focused primarily on the formation of Iraq’s new government. Both sides hailed developments in KRG-Russian relations and stressed the significance of strengthening economic, agricultural, industrial, cultural, and trade ties, the KRG statement said. Russia already has substantial oil interests in the Kurdistan Region. Rosneft has begun work at three sites in Duhok province – Batle, Zawita, and in Sarsang and Chamanke in Amedi. The firm is expected to extract 180,000 barrels of oil per day. Rosneft reached an agreement with the KRG in October 2017 to develop five oil blocks. According to estimates, these blocks contain 670 million barrels of oil. Rosneft has been given 80 percent of the shares of these blocks in return for $400 million to the KRG. The Kurdistan Region lost roughly half of its exportable oil when the Iraqi government seized control of the Bai Hassan and Avana oilfields on October 16, 2017.